The charming Victorian house at 1 Brown St. straddles the past and the present with architectural details of the early 20th century and modern amenities. 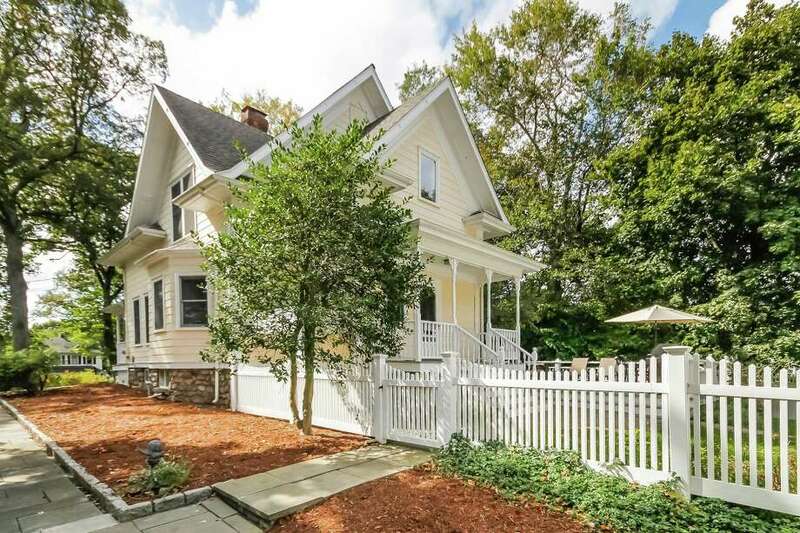 DARIEN — A charming Victorian house at 1 Brown St. straddles the past and the present to perfection. The pale yellow house with white trim was built in 1914 with many attractive architectural details, and its welcoming covered front porch speaks to that gentle time when residents sat in leisure. This house also has a wood deck in the fenced rear yard for activities associated with today’s lifestyle: relaxing, entertaining, and grilling. The 2,039-square-foot house sits on a corner lot of just over a half an acre in a part of town that makes it within walking distance of the Noroton Heights Metro North train station, schools, restaurants, shops, and Woodland Park. A bluestone path lined in Belgium block travels from the detached two-car garage along the side of the house providing access to the backyard and the front porch. Between the garage and house there is a gate in the white picket fence. There is parking for several vehicles in front of the garage. The front exterior is adorned in traditional Victorian details including scalloped, or fish scale, shingles on the upper part of the façade to the roofline, turned balusters, and decorative fan brackets on the turned porch posts. The same details of the brackets are also found on the outer screen door. The front entrance is framed by sidelights. Inside the details continue beginning with the dentil molding above the front door that opens into the foyer. This entrance hall has paneling on the walls and ceiling and a Palladium window topped with a keystone. Despite its vintage this house has rooms that are generous in size with tall ceilings. The large formal living room has a brick fireplace and a bay window. An area under the stairs is an ideal location for a dry bar, which is especially convenient when entertaining guests. In the formal dining room there is millwork on the ceiling, chair railing, and dentil crown molding. The same dentil molding is also found in the den, or family room, in the crown molding and above the door jambs and windows. French doors separate the dining room from the kitchen, where there is a small center island topped with butcher block, a coffered ceiling, and walk-in pantry. Like the front door the door to the backyard has Victorian detailing and it provides access to a covered rear porch. The skirt board of the staircase is decorative, a unifying feature along with the rest of the Victorian detailing. On the second floor there are three bedrooms, all of which have a ceiling fan, and one updated full bath with new faucets, lighting, and mirrors. The master has a walk-in bay window area, a tall vaulted ceiling, built-in recessed shelving, Victorian-style raised paneling on the upper walls, and two walk-in closets. In the finished basement there is a good sized laundry room with a sink, counter, and cabinets. This lower level includes more than 500 square feet of recreational space and a large storage closet with built-in shelving for organization. Although there are no defined rooms, other than for the laundry, there are spaces for a sitting room, playroom, and exercise area. The backyard has a sand area for play equipment. Above the garage there is a huge loft space for storage. It could also be finished to create additional bonus space or a home office.